Benchmarks. Metrics. Quality indicators. Dashboards. Key performance indicators. Attend any management meeting and chances are that quality measurement buzzwords will fill the air. The business of coding is not exempted, and every year the link between the public reporting of health care quality and the quality of the coded data themselves becomes more apparent. 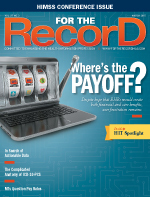 Historical benchmarks for hospital coding departments include reimbursement-related issues. Accounts receivable (unpaid claims) is directly affected by the number of uncoded patient encounters. Included in the factors that feed this metric is the number of cases on hold for missing documentation such as physician orders, discharge summaries, and pathology reports. Complicated charts that may get pushed aside in favor of faster or easier-to-code charts and encounters with contract and administrative issues that may delay coding the record also play a role in the metric. And don't disregard the importance of processing discharged accounts efficiently and swiftly through the coding portion of the revenue cycle. Both the speed with which each case is prepared for coding and the speed with which it's completed must be included in the information to be benchmarked and monitored. Speed, however, is no longer the king of coding management. Consider some of the critical internal and external issues associated with coding accuracy. Coded data affects not only reimbursement but also benchmarking, public health tracking, health care policy, clinical and financial decision making, quality of care, and publicly reported data. As such, it must be complete and accurate in all cases, not just those involving payers such as Medicare and Medicaid. If coding is performed quickly but inaccurately, the case mix may fall. Conversely, the case mix may rise if coding is slower but more accurate. For those cases in which payment is based on coding, the former results in lower reimbursement while the latter likely improves the bottom line. Be aware that a sudden increase in case mix or one well above the norm of peer facilities may have the Office of Inspector General licking its collective chops in anticipation of an audit, fines, and penalties. When it comes to coding production, more is better, but only if it's correct. When the numbers are reviewed at high-level management meetings, how will the coding department's performance be measured? To accurately portray the department's quality, coding leaders must be involved in selecting the metrics. Coding managers don't need Six Sigma certification or a PhD in data management to select measurements that identify both department excellence as well as risk. While department administrators are likely to be intimate with outcomes, managers and coders will be on a first-name basis with the issues that created them. When selecting benchmarks, managers should involve key employees throughout the coding department by listening to suggestions and sharing successes as well as failures. Without coder input, a balance between speed and quality is difficult to achieve—and balance is essential to achieving excellent results. Managers must know data sources—not everyone will be willing or able to achieve excellence, but even those who can't be good will want to look good. The media is full of examples of top officials who have resigned in discredit after accepting data that were incorrect whether by accident or design. Remember to "trust but verify." Strict productivity expectations often result in rushed chart reviews and missed or inaccurate diagnosis and procedure codes. They can encourage coders to cherry-pick simple charts and dump harder assignments on better—or at least more tolerant—colleagues who then may receive poor evaluations, be fired, or become disgusted and quit. Is this quality? No, it's just speed. If coding managers demand that all encounters are coded immediately after discharge, the staff may make it happen, but is it best practice? That depends on whether all queries for clarification were made and the responses documented, all pathology reports are completed and addressed by the provider, and all notes, operative reports, and discharge summaries are in the chart at discharge. If coding speed is prioritized over accuracy, will organizations achieve best-practice outcomes? Perhaps, if their primary goal is to receive less money faster, if public reporting of severity of illness and risk of mortality is unimportant, and if no significant decisions are ever based on the hospital's case mix index. Demand perfect coding; devote extra hours to education classes, seminars, and webinars; and achieve 99% accuracy of all coding and diagnosis-related group assignment. Is that the ultimate coding department? Not if the facility and the physicians can't get paid because the unbilled claims are literally stacked to the ceiling while the coders each complete four perfect charts per day. Not if the budget is busted on contract coders and overtime because productivity is so low that revenue cycle goals can't be met. If organizations plan to create a true best-practice coding department, requiring a balance between objectives and processes is not optional. While coders can't be expected to be perfect, neither should they be required to be as speedy as the top driver at the Daytona 500. Not every documentation question needs to be queried and not every missing operative report requires coding be held until the surgeon returns from Europe. Identify normal standards, but also create processes to handle significant exceptions. Relaxing strict speed indicators in return for increased data accuracy is paramount, but be certain that standard is forthcoming. Coding leaders can't manage what they can't measure. However, the criteria for what is measured must be accurate, relevant, and essential to quality performance. Be thorough and consider all possibilities. For example, if speed and timing are the prime quality indicators, but accuracy is neglected, determine the effects of such a strategy. In order to identify and improve key factors, organizations must monitor, measure, and maintain all products and processes. Why? Because limiting what's measured also puts a cap on the quality that can be achieved. — Judy Sturgeon, CCS, CCDS, is the clinical coding/reimbursement compliance manager at Harris County Hospital District in Houston and a contributing editor at For The Record. While her initial education was in medical technology, she has been in hospital coding and compliance for 26 years.